Cybercrime is on the rise. Digital communication systems integrated with regular encryption are no longer secure. Big companies continue to be vulnerable as constant reports and news stories make this clear, and many remain unaware about these security breaches, hacker attacks and privacy risks until it’s too late. Exercise Due Diligence When Selecting a Secure Conferencing Service – Your conferencing provider should be integrating iron-clad security measures into their conference calling systems and web servers. Have your IT administrators carefully check the security protocols of your shortlisted services, and do an extensive trial run before signing up for a subscription. Make sure that the brand you’re signing with has extensive expertise on security and privacy. SSL Conference Call Encryption – When it comes to web conferencing, make sure your provider is protected by updated SSL certificates on the server level. This ensures that all communications between participants are encrypted and private. Although hackers can come up with a variety of ways to try and decrypt or access these private conversations, having SSL encryption makes it ridiculously difficult for them to do so. While there is still a risk that cyber criminals can breach the first levels of encryption, your conference call provider should have an efficient and thorough security system that sends out alerts to administrators. This enables them to block these breaches before they can move on to the next layers of defense. 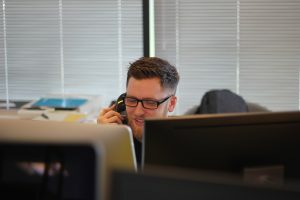 Secure Passkeys and Call Monitoring – A secure conference call service should offer secure passkeys or unique PINs along with call monitoring for more robust security. With secure and unique passcodes, callers can be tracked and identified and their details should show up on the call monitoring platform where you can actively see and double-check. The solution should also have an option to provide single-use or permanent passcodes that can be retired at any time. This way, security is upheld every step of the way. 2-Factor Authentication (2FA) – You can also check if your conference calling provider is integrated with 2-factor authentication. This is where your participants must enter a unique code that changes every 20 seconds or so before they can join a conference call. This code is available in a mobile app or a desktop application, which can be set up by first entering a code that’s presented by your conference calling system when you send out secure invitations to users’ mobile devices and business emails. This can make it more challenging for an eavesdropper to covertly join your conference calls because many 2FA apps can function even without an Internet connection, preventing them from accessing these devices to get these access codes. Call conferencing security is quite challenging to fully guarantee. However, these tips can enable you to significantly reduce the chances of encountering security breaches and privacy risks. Don’t forget to also protect your database of conference call recordings with the same measures described above. Plus, make it a point for your IT administrators to regularly perform checks and penetration tests. This way, you’ll be able to ensure that your conference calling system is fully secured at all times. Secure and Scalable Options – A reliable conferencing call service should provide room for expansion without sacrificing security. The more that people want to use it will mean re-scaling conferencing components. When selecting a conferencing system, choose a certain type that would be more likely to support the future needs of your business, with an emphasis on maintaining security with scale. This will help you avoid unnecessarily investing too many resources just to shift to an entirely new and more secure conferencing provider. If you would rather opt for cheaper or more affordable choice, keep in mind that most free conferencing services are just integrated with regular security protocols and is definitely not a worthy tradeoff. It’s obviously not a wise choice especially since your business data is on the line. You’re recommended to go with a more reliable and secure conferencing service with industry standard security.